This week’s elections featured a number of losses for progressive politics, but there was at least one silver lining: They showed that when voters have an opportunity to reject big donor politics, they overwhelmingly will. In both Maine and Seattle, voters approved ballot measures to implement or strengthen public financing, an important reform that can increase the diversity of the donor pool and reduce the power of big money in politics. In Maine, the ballot initiative would boost funds for qualifying candidates and require more disclosure of some political spending. In Seattle, Initiative 122 implements a first of its kind voucher program, which gives each voter $25 vouchers that they can give to their preferred candidate for mayor, city council and city attorney. The initiative also bars contribution from companies or individuals that have large contracts with the city. Why do these programs matter? 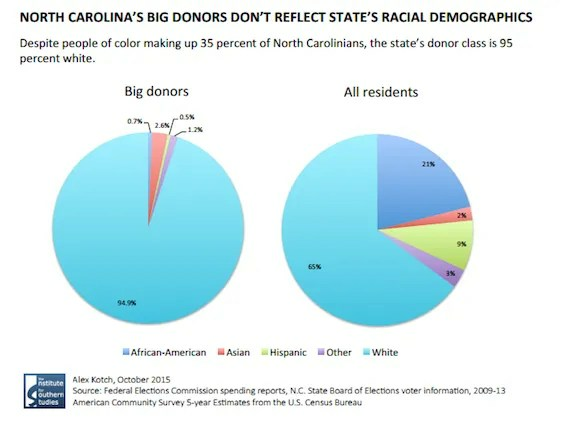 A recent study from the Institute for Southern Studies of North Carolina shows that the donor class is overwhelmingly white, far whiter than the general public. Alex Kotch, author of the report, writes, “95 percent of the largest North Carolina donors to key federal races in the 2014-2016 election cycles were white, while non-Hispanic whites make up 65 percent of the state population.” A study of Seattle’s 2013 election suggests that while Seattle is 67 percent non-Hispanic white, the neighborhoods from which more than half of contributions came from were 80 percent white. There is evidence that public financing would increase the diversity of the donor base. A study of New York City’s 2009 municipal election finds that “donors giving $10 or less live in neighborhoods that are more racially diverse than the city as a whole.” Research suggests that the city’s public matching system (which uses public funds to match small donations) increased the diversity of the city’s donor pool. Otherresearch suggests that the small donor pool tends to be more racially diverse than the large donor pool and that donors as a whole tend to be whiter than the general population. The donor pool also has differing preferences from the general population. As I’ve noted several times, there is ample evidence that donors are pulling the nation to the right on economic issues, exacerbating rising inequality. 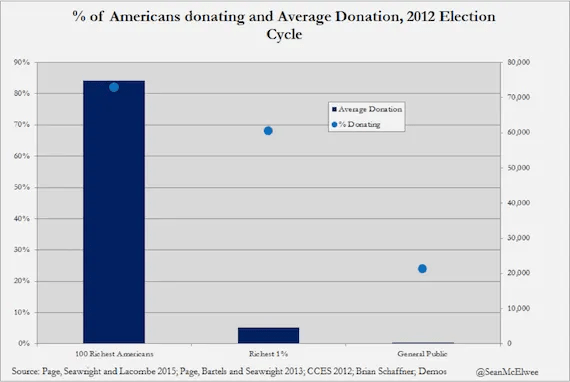 Donors of all stripes tend to be more economically conservative as the chart below, made with data from the 2014 Cooperative Congressional Election Study shows. 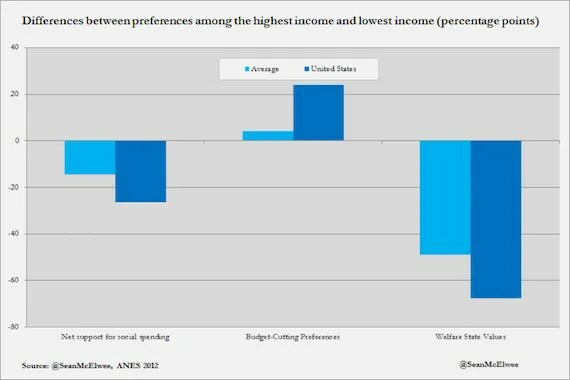 A study by Didi Kuo and Nolan McCarty finds, “Donors are also more supportive of low taxes and freer trade. Donors were slightly less supportive of the Affordable Care Act, which overhauled the American health care system to promote universal coverage.” One study by a group of scholars spearheaded by Wesley Joe of the Campaign Finance Institute finds, “Large donors are more likely than small donors to give in the interest of advancing their own narrow economic concerns, as distinct from a more general concern about the economy.” The chart below shows this. 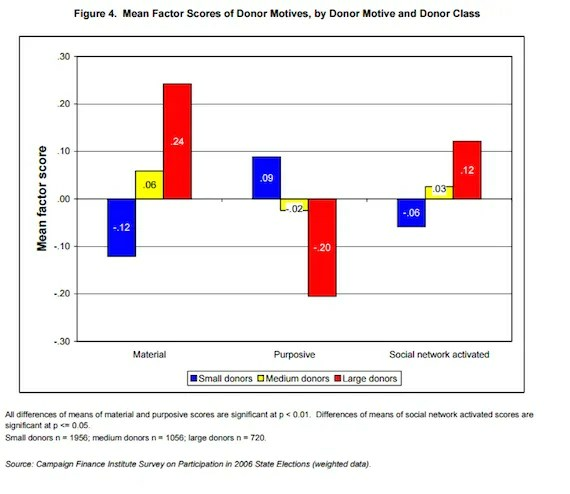 Large donors are far more likely to report donating for “material” reasons (advancing their own material interests), while small donors tend to donate for “purposive reasons” (ideological alignment and which candidate they feel would be better for the economy). Their study also finds that small donors are closer to the opinions of non-donors than large donors, with large donors being more economically conservative. Public financing of elections is popular and, given the Supreme Court decisions over the last few decades, one of the few options left to reformers that want to make America live up to its democratic values. The ballot initiatives in Seattle and and Maine provide a glimmer of hope in the often bleak news about the increasing power of the donor class. This entry was posted in Economics, Politics on February 19, 2016 by seanadrianmc@gmail.com. While some billionaires, like Warren Buffett, are outspoken on political issues, most tend to say very little, or speak in vague generalities. But a new working paper by political scientists Benjamin Page, Jason Seawright and Matthew Lacombe finds that what billionaires say and what they do are dramatically different. While billionaires rarely go on the record discussing Social Security and taxes, they work behind the scenes to oppose policies favored by average Americans. Often, there are deep disconnects between what billionaires say regarding policies and which organizations they fund. The authors dub this “stealth politics.” Indeed, only 26 billionaires (a quarter) made any statements on tax policy over the last 10 years. Of these, the vast majority of statements came from a small but politically active and visible group: Michael Bloomberg, Warren Buffett, Bill Gates and George Soros, who made 65 comments in total. Even those statements tended to be vague and rather brief. More strikingly, only three of the billionaires made statements regarding Social Security. When billionaires do make statements, they appear to be a rather diverse and moderate group. 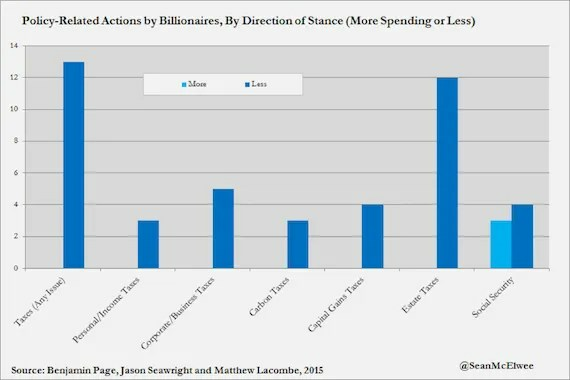 As the chart shows, when speaking on most key issues, billionaires are split pretty evenly (although they tend to favor more carbon taxes, and fewer corporate taxes). But that billionaires were largely silent and moderate doesn’t mean they aren’t concerned with more radical policies. The billionaires the authors examined were rather active politically. One-third either hosted a political fundraiser or bundled contributions for a candidate (this compares to one-fifth of the top 1 percent of the wealthiest and very few if any average Americans). A whopping 82% of the billionaires in the sample gave to political candidates in 2011-2012, and they gave, on average, $74,982 (that’s $20,000 more than the median household income in the United States). Brian Schaffner, a professor of political science at University of Massachusetts-Amherst and one of the lead researchers on the Cooperative Congressional Election Study (a massive survey that includes 50,000 respondents), provided data on the what the general public gives. CCES data suggest that 24% of Americans gave money in the 2012 election cycle, but only 6 percent gave more than $200. On average, the general public gave $336, meaning that the average donation by one of the super rich is 223 times more than the donation of the general public. Unsurprisingly, given other research, the billionaires heavily favored the Republicans: 65 percent of those who made partisan contributions were exclusively or primarily to Republicans. On average, each billionaire in the sample gave $53,227 to a Republican candidate and $21,411 to Democrats. To further discern political preferences, the authors took a new tack: They examined political donations to issue-specific organizations, rather than to candidates, parties or PACs. (For research on these subjects, see here). This has two advantages. First, much of the money that’s given to more moderate candidates is aimed at cultivating access and creating the appearance of “moderation.” If a billionaire wants to change policy, they are better off donating to incumbents or candidates highly likely to win than dark horse candidates that are closer to their values (a lesson the left could learn from). This argument makes sense: research shows that individuals who donate to campaigns tend to focus on ideological purity, whereas PACs and businesses spread money more widely and focus on getting access and policy results. Given the vast amounts billionaires give, it would make more sense for them to pursue the strategies a PAC or business would, not the strategies of an individual donor. Second, placing candidates on a simple left/right axis obscures more than it illuminates. Research suggests that the wealthy are more socially liberal than the average American and far more fiscally conservative. This would lead to the appearance that the rich are more in line with American values than they actually are. What the researchers found through the aforementioned strategy is interesting. To use just one example: While billionaires often spoke in favor of estate taxes, the 12 percent of billionaires who donated to political organizations focused on estate taxes all donated to organizations seeking to reduce them. The authors created a model to test stealth politics, and they find that “among those who did not speak, higher wealth led to more conservative overall patterns of political action related to taxes or Social Security.” That is, the wealthy tend not to speak out when their views would be unpopular, but rather covertly donate to unpopular causes. The charts below show this fact rather dramatically. However, even these data understate the extent of the problem. Many of the organizations that billionaires would use to advance their political views are 501(c)4 or (c)6 organizations, which don’t have to disclose their donors. It will likely increase even more in the future. The first step toward reducing stealth politics includes some rather simple proposals: First, all political donations should be disclosed. While the Supreme Court has decimated most possibilities for robust campaign finance reform, this door remains open. An easy first step would be an executive order that mandates that government contractors disclose political donations. 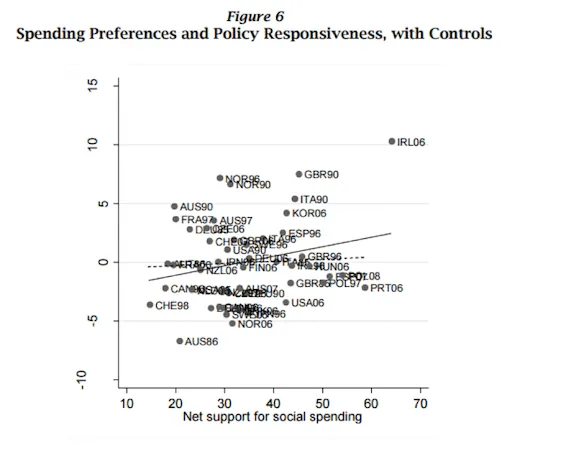 Research by Christopher Witkosuggests why this is necessary: He finds that government contractors that donate more money to federal candidates receive more contracts, even after controlling for numerous relevant factors. A recent Demos report by Naila Awan and Liz Kennedyfinds that 80 percent of the largest 20 government contractors don’t disclose the money they contribute to 501(c)(4) and 501(c)(6) organizations. The United States also needs a robust public financing system, which would allow for more small donor democracy. According to Brian Schaffner, the average small donation (under $200) in 2012 was $85, meaning that to equal the $889 million the Koch Brothers plan to spend, it would take 10.5 million small donors. There are many policies that are required for the U.S. to become a true democracy. To begin, we need to end the stealth politics of America’s wealthiest citizens and amplify the voices of ordinary Americans. This entry was posted in Economics, Inequality and tagged billionaires, Page on February 11, 2016 by seanadrianmc@gmail.com. The solutions are simple to imagine, but more difficult to put into practice. Unions promote both economic and political equality – they both push up the wages of workers and mobilize politically for the interests of the middle class. Automatic voter registration would boost turnout, and combined with non-partisan get-out-the-vote operations offers the most viable route to boosting turnout among low-propensity individuals. Disclosure of campaign donations, robust public financing of electionsand limits on the ability of corporations and wealthy individuals to influence elections could alleviate the pervasive influence of money over politics. This entry was posted in Economics, Politics and tagged Bartels on February 10, 2016 by seanadrianmc@gmail.com. Long-term unemployment is the scourge of modern economies. In a society where people take value from work, unemployment is destabilizing and degrading. A bout of long-term unemployment can permanently scar worker, leaving them with lower wages and fewer usable skills. Last year, Jared Bernstein and Dean Baker put forwarda persuasive case for a return to full employment as the palliative to unemployment. But it’s increasingly clear the private sector cannot create full employment on its own. Even at the height of the Clinton boom, millions of African-Americans and low-skilled workers were jobless. To get full employment, progressives should embrace an idea that hasn’t surfaced recently in mainstream American political dialogue: a universal government job guarantee. Reniqua Allen refers to this reality as the “permanent recession” that Black men face. People of color are the first to lose jobs during a recession and the last to gain them in a recovery. Further, many future losses from new technology will occur in heavily racialized sectors, like retail and fast food. Occupational segregation means that people of color, and particularly women of color, will bear the brunt of job losses. Racial justice requires addressing the future of work. However, the AFL were opposed to government-sponsored unemployment insurance. Skocpol cites Alex Keyssar who writes that, “unionists stressed that public works programs were preferable to simple poor relief in three respects: They paid workers a living wage rather than a pittance; they permitted jobless men and women to avoid the demoralizing consequences of accepting charity; and they performed a useful public service.” However, over the past decade, the government hasn’t guaranteed jobs; instead ,conservative austerity policies have lead to millions of public sector jobs being cut. One partial reason the government job guarantee may be off the political map these days is because many of those who support such a program no longer turn out to vote. Using ANES, I find that while non-voters are more likely to support than oppose a government-job guarantee, voters are overwhelmingly opposed. However, the ANES question is also rather strongly worded: The option that “government should let each person get ahead on own” is appealing, but in an economy where millions of Americans are unemployed or under-employed even at the lowest levels of unemployment, it also seems mythological. A recent YouGov poll asks a more pointed question: “Would you favor or oppose a law guaranteeing a job to every American adult, with the government providing jobs for people who can’t find employment in the private sector?” In this formulation support increases significantly, though as the chart below shows, there are still race and class gaps. A job guarantee could leverage two of the strengths of the progressive movement: electoral power at the federal and city level. A progressive President could direct money and projects to mayors, thereby ending the scourge of inner-city poverty that has plagued America for far too long. Progressives have a long history of creating more jobs, but have failed to articulate an argument for why that is true. That is mainly because progressives have preferred an active monetary policy, rather than active fiscal policy, to boost employment. But voters struggle to understand monetary policy. On the other hand, they could understand a universal job guarantee. Research suggests that Obama’s response to the Great Recession may lead to voters trusting Democrats more on the economy; but as of yet, this has yet to materialize, and Republicans remain more trusted. A universal job guarantee could change that. A recent survey of 200 leading economic security experts by the Center for Global Policy Solutions finds that 91 percent say that job creation is important for closing the racial wealth gap. The report recommends a National Investment Employment Corps, guaranteeing jobs with an annual salary of $23,000. The biggest opposition to a government job guarantee will almost certainly come from big business, and particularly the business-conservative wing of the Republican Party. This may seem surprising, since businesses would benefit from infrastructure and public works, as well as having a highly trained workforce. But this is to misunderstand what corporations seek: not profit, but power. Economist Chris Dillow makes this argument, arguing that full employment would deprive business of political power by removing their mystical power over the “state of confidence.” If, in fact, the government can maintain full employment, it won’t have to kowtow to business on taxes, regulation and spending. There are also labor implications. If workers could chose to reject a private sector job knowing that a public sector job was available, business would actually have to make working conditions livable and pay a fair wage. This “reserve army of unemployed paupers,” as one economist called them, ensures that workers accept degradation on the job rather than suffer the horrifying fate of unemployment. The ultimate goal of business conservatives is to turn labor into one homogeneous glob that can be fired, re-located and re-trained at will. Thus they oppose paid sick leave, family leave and higher wages, even though all of these changes boost workerproductivity. Business conservatives despise the minimum wage, though there is very little credible evidence that a higher minimum wage would eliminate large numbers of jobs. The threat of the minimum wage is that it would cut into profits and, more importantly, power. Though more worker ownership would boost worker happiness and productivity, it worries bosses who feel they would be ceding control. Business wants to control workers as much as possible, devising Orwellian strategies to intrusively monitor workers. Business conservatives want workers to be expendable, so they have fought to ensure that if a worker is killed or maimed on the job, they will receive next to nothing. With workers free to pursue a well-paid, productive public job, corporations would have to pay fairer wages and ensure better labor standards. But while private companies say they love competition, in reality nothing is more terrifying. That will be the most difficult force to overcome in the push for a public jobs program. But if it can be overcome, Americans will benefit extraordinarily. In the wake of the Great Recession, LaDonna Pavetti, writes, “thirty-nine states and the District of Columbia used $1.3 billion from the fund to place more than 260,000 low-income unemployed adults in temporary jobs in the private and public sectors.” The result for workerswas higher incomes, and an easier transition into the workforce after the subsidy program ended. During the Great Depression, make-work programs funded art and infrastructure, most of which we still enjoy today. In the future, robots may do many of the jobs that humans currently do. That shouldn’t be a lament: We can now put human effort into healing the environment, curing disease and ending hunger. Today, millions of Americans are jobless. Putting them to work would be a boon for economic growth. In the future, everyone can have a truly fulfilling and life affirming job. But that’s going to require some will, and some government. This entry was posted in Economics, Inequality, Politics, Race and tagged inequality, job guarantee, politics on February 2, 2016 by seanadrianmc@gmail.com. Co-written with Demos Senior Policy Analyst Robbie Hiltonsmith. Over the last decade, states have made massive cuts to higher education, with average state support falling from $9,729 per student in 2001 to $6,815 in 2011. While a large share of the blame for these cuts can be pinned on the financial crisis and subsequent recession, some of the decline is due to a deliberate effort to eviscerate public higher education. For instance, Bobby Jindal plans to savage higher education spending in Louisiana to the tune of $141.3 million, or about 12 percent of the state’s higher education budget, to pay for tax cuts. In Wisconsin, Scott Walker is cutting $300 million over two years, again to pay for reckless tax cuts. Kansas is an even sadder story. Though the state had a large reserve fund in 2012, Governor Sam Brownback quickly depleted it with a massive tax giveaway to the rich. Now he’s cutting K-12 and university funding to the tune of $44.5 million. There’s a good reason our list of governors seeking deep cuts is shaded a uniform red: Both research and history shows that Republican-controlled states are more likely to cut higher education. One study found that when Republicans take over governors mansions they reduce spending on higher education by $0.23 per $1,000 in personal income (a measure of the state’s total tax base). Each 1 percent increase in the number of Republicans in the legislature leads to a $0.05 decrease. Given that theaverage spending on higher education across all states in 2014 was $5.47 per $1,000, the effect is large. Nationwide, the total impact of these cutbacks is breathtaking. Between 2008 and 2013, states cut a total of $16 billion, adjusted for inflation, from their higher education budgets, even as enrollments rose more than 11 percent. Funding per student dropped even more dramatically, falling by more than 27 percent, or about $2,500 per student. These cutbacks, in turn, have translated nearly 1-to-1 into tuition increases, which averaged nearly $3,000 over the past decade. But the question is not simply deficits, but priorities: Just seven months of funding for the F-35 Fighterwould be enough to fully restore higher education spending across the nation. A new Demos study estimates that 78 percent of tuition increases at public universities in the past decade can be explained by decreased state spending on higher education (see chart). Commonly cited factors like “administrative bloat,” are far less important, accounting for only 5 percent of the increase in higher education costs. These state cuts and resulting skyrocketing tuition prices are incredibly worrying for upward mobility in America, because they’ve forced young people seeking a college education to borrow unprecedented amounts just to earn a degree. Low-income students and students of color leave college with more debt than wealthy white students (see chart), and they bear the brunt of austerity. Public universities and community colleges are important, because the top tier of private universities are very exclusionary, and few poor and middle class students are admitted. Further state cuts to higher education will create a world where only some, mostly wealthy Americans have a shot to better their life by completing higher education. It’s not just progressives making this point; recently, Standard & Poor’s argued that inequality was slowing growth by reducing college graduation rates among low-income people, likely in part due to the effects of the debt necessary to finance low-income students’ educations. The analysts suggested that a way to bolster upward mobility and reduce inequality would be increased college attainment. Yet in recent years, many conservatives, who claim to support economic growth and business, have made savage cuts to education. These cuts are particularly shortsighted because the benefits of higher education, both for individuals and society at large, pay for the cost of investment many times over. The body of research on the impacts of higher education is massive, but their consensus is that increased higher education impacts nearly every corner of society, from increased economic growth to lower crime, better health, greater civic participation, and even childhood development. A few highlights: One study foundthat 8.7 percent of all economic growth between 1959 and 1998 could be attributed to increased education. Other studies have found that increased higher education leads greater rates of voter participation, to the tune of 22 percent; a 15 percent reduction in crime, and better cognitive development among children of parents with college degrees. On the flip side, the costs of state disinvestment in higher education are similarly staggering. Further state cuts will lead to even higher levels of student debt, which then leads to lower homeownership rates, less retirement savings, and fewer vehicle purchases, among other effects. Previous Demos work suggests that $53,000 in student debt will lead to lifetime wealth loss of $208,000, largely through lower retirement savings and home equity. Although public investment in higher education is broadly popular, the wealthy tend to be the least supportive. In their recent study of the wealthiest Americans, Benjamin Page, Larry Bartels and Jason Seawright find that 78 percent of the general public agree that “[t]he federal government should make sure that everyone who wants to go to college can do so,” compared to only 28 percent of the richest Americans. There are bright spots in this sad story: President Obama’s plan for free community college is a welcome opportunity for the government to step in and fill this gap. Two weeks ago Senate and House Democrats introduced a resolution to create debt-free higher education. Hillary Clinton says she’ll be rolling out a comprehensive plan to tackle student debt. On the other side of the aisle, the House Republican budget would eliminate guaranteed funding for Pell Grants, which helped 9 million low income students attend college in 2013-2014 school year. One analysis suggests that some students using the Pay As You Earn (PAYE) program would end up with twice the debt under the Republican budget proposal. They would also As the national discussion about higher education proceeds it’s important to remember the government has an important role to play in supporting debt free higher education. This entry was posted in Economics, Politics and tagged college cuts, conservativism, higher education on January 22, 2016 by seanadrianmc@gmail.com. Consider the following fact: The last time a Republican president created an average of 1 million jobs a year over the course of his presidency was nearly three decades ago, under Ronald Reagan. When the the 2016 election comes around, a full 44 percent of voters will have entered the workforceafter that period of time. Then consider that Barack Obama has created 7.35 million jobs since taking office, and will almost certainly cross the million-per-year threshold. And that, for many Americans, the last time the economy was working for them was under Bill Clinton. As the chart below (using data from the Economic Policy Institute) shows, the last time Americans at the bottom of the income distribution had a raise was during the sustained employment growth under Bill Clinton. The conclusion? If Democrats want to win the White House, they need to promote a progressive, pro-jobs agenda. I’ve previously discussed the rather large body of research suggesting that not only does the economy perform better under Democrats, it tends toperform better for everyone under Democrats. People of color do far better in terms of employment, incarceration and income growth when a Democrat is in office. The incomes of the poorest tend to increase more rapidly as well. Both effects are likely tied to two major policies: First, Democrats tend to preside over lower unemployment rates; and, second, they are far more likely to raise the minimum wage. There are other factors at work, of course: I’ve noted how market conditioning (things like regulatory policy) can change outcomes as well. But another major factor is that the key to increasing the bargaining power of workers and creating a more racially just society is jobs. And progressive policy creates jobs. There are several specific factors that explain this. (1) Liberal governments tend to invest more money in infrastructure and education, both of which bolster growth. (2) While conservative governments try to maximize growth for the rich by reining in inflation, progressives benefit everyone by reducing unemployment. (3) Conservatives spend a large amount of their political capital reducing labor force participation among gays, people of color and women. Conservatives oppose policies that would help women balance work and family responsibilities, openly sabotage their economies to discriminate against gays, and pursue policies that overwhelmingly harm people of color. By doing this, conservative governments shut out talent and competition, in all probability harming economic growth: One study finds that about one-fifth of the increase in productivity growth between 1960 and 2008 can be explained by the increase in talent from women and people of color getting jobs they were previously excluded from. (4) Conservatives pursue policies that increase inequality, which studies suggest can also slow growth. (5) Conservatives are less queasy about the influence of money on politics, fostering cronyism that can undermine growth. (6) A weak safety net means that fewer Americans can take entrepreneurial risk, when entrepreneurship is a key factor in bolstering growth. 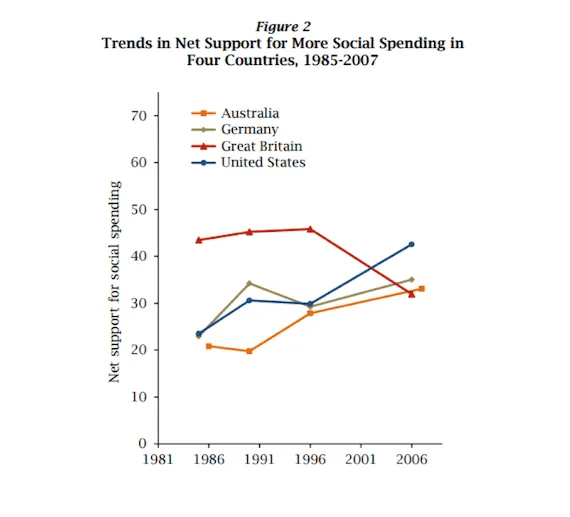 (7) By creating a winner-take-all economy, conservative governance reduces social trust necessary for growth. (8) By promoting war and violence abroad, and a bloated military at home, conservative governments reduce the money available for clean energy, healthcare, education and tax cuts for the middle class, which create more jobs. Matt Yglesias also argues it could increase oil shocks, thereby harming growth. (9) By promoting an oversized and unregulated financial system, conservative governments make crisis more likely. Studies also suggest that when the financial sector gets too large it starts to reduce growth. (10) By reducing upward mobility, conservative governments reduce growth by leaving millions of opportunity-less youth mired in poverty. (11) Conservatives are less amenable to more open immigration policies, when immigration boosts growth. Whichever of these factors cause conservative governments to be less effective, the differences are stark. The chart below shows the average job growth under each president over the last 75 years. Bloomberg examined private sector job growth between January 1961 and April 2012. Over that period, Republicans have held the Presidency for 28 years and Democrats for 23. Republican presidents created 71,000 jobs per month, while Democratic presidents created 150,000. In total, Democrats created 42 million jobs, compared to Republicans 24 million. Warren cites research by Celinda Lake showing that three core messages resonate with Americans across the political spectrum: infrastructure spending, government investment in green energy and government creating jobs in high unemployment communities, particularly communities of color. As the chart below shows, progressive policies are popular with the Rising American Electorate (African Americans, Hispanics, millennials, and unmarried women) who veteran pollster Stanley Greenberg notes will be more than half of the electorate in 2016. The Lake memo also notes that turnout is key to a progressive victory. In 2014, 34.5 percent of the Rising American Electorate who voted Obama for Obama’s re-election in 2012 stayed home. Mobilizing these voters will be key. If Clinton is the nominee, she should emphasize the track record of Democrats creating and sustaining jobs. Instead of running away from Obama’s achievements should build on them. She should focus her message on a strong public sector being necessary for a strong private sector. By setting the rules for fair play, the government ensures that those who get ahead do so by creating value, rather than extracting it. By investing in the next generation, government gives private companies an educated and highly trained workforce. By ensuring paid sick leave, childcare and universal pre-k, the government allows women to bring their skills to creating prosperity. The difference between conservative and progressive governance is simple: one benefits a small elite while the other promotes widespread prosperity. This entry was posted in Economics, Politics and tagged economy, GOP on January 20, 2016 by seanadrianmc@gmail.com.